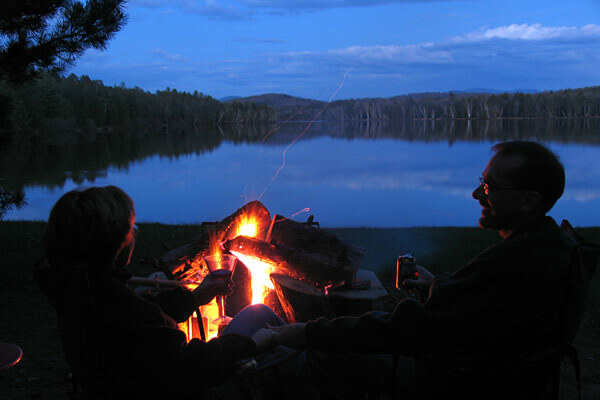 Camp fires are one of the most popular nightime events at Fish Creek. After the sunsets, you will see camp fires all the way around the ponds as you look out across the water. 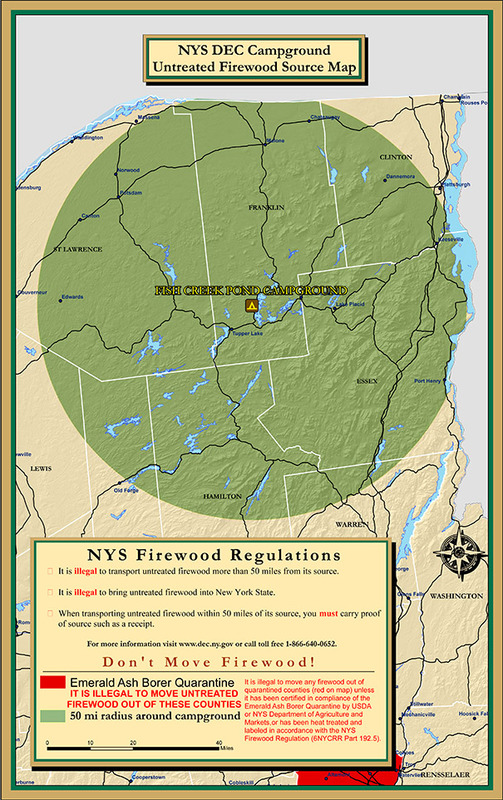 The NY State DEC now requires that you self-certify that any untreated firewood brought into the park originates from no more than 50 miles from the campground. The new regulation is now in effect that prohibits the import of firewood into New York unless it has been heat treated to kill pests. The regulation also limits the transportation of untreated firewood to less than 50 miles from its source. It must have a receipt or label that has the firewoods source and it must remain within 50 miles of that source. For firewood not purchased (i.e. cut from your own property) you must have a Self-Issued Certificate of Source (pdf, 100kb), and it must be sourced within 50 miles of your destination. Print and sign the Wood Certificate then bring it along with you to the campground. You can buy wood directly from the DEC at the campground front gate. Cost is $8 for a bundle of dry hardwood. The campground store (The Trading Post) sells small packaged bundles of wood. The shrinked wrapped kiln dried hardwood is quite good and sells for $5.99. There is the 'Two Guys and a-buncha wood' truck that passes through the park, twice a day that sells wood in prime season only (ie summer months). They come in via the front gate at 9am and 3pm. It takes them about 1.5 hours to make each round. They have medium sized hardwood for $7 a rack. Katie Hall who runs the High Peaks Treats does an ice and wood run in the late afternoon (end of June till Labour Day). For $7 you get a standard 2cu ft rack of hardwood and mixed. Katie will also be selling hardwood and mixed face cords in 2013. Pricing will be available by March 1st. You can contact Katie (and Tom) at hptreatsllc@hotmail.com. 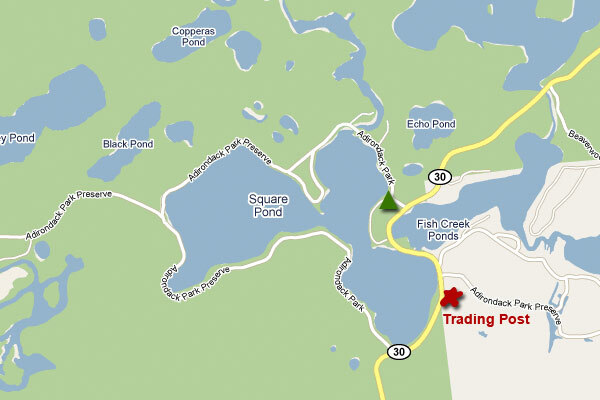 In Tupper Lake (15 minutes south of Fish Creek on Route 3), there is a large wood lot owned by John. (some campers refer to him as George) where you can purchase both small and large amounts of hardwood. The lot is on the south side of Route 30, at the bottom of the hill as you drive into Tupper Lake from the east. Latest reports indicate his wood is cut a bit short, but it is responibly dry this year compared to last year, He is located on your left if you are driving from Fish Creek just before the hill going into Tupper). There is usually a Wood sign out by the road when it is open. If you are wondering about Roy, he no longer sells wood to campers and he has removed his wood rack. On your way to Fish Creek you will find several road side, self serve wood racks both north and south of the campground.